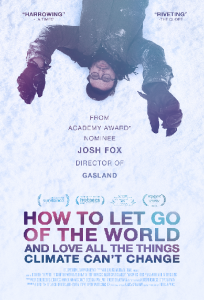 The Green Sanctuary Environmental Justice Film Series presents it’s final spring film, “How To Let Go Of The World And Love All The Things Climate Can’t Change” on Saturday, June 9 at 7:00 pm in the MUUC Church Parlor. Traveling to 12 countries on 6 continents, the film acknowledges that it may be too late to stop some of the worst consequences and asks, what is it that climate change can’t destroy? What is so deep within us that no calamity can take it away? Josh Fox’s new film is unlike any other you’ve ever seen on climate change – beautiful, poignant, important!